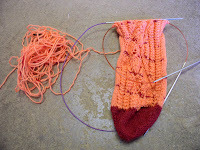 Lorrie knits and sews: Popping up for air! 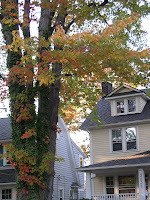 October in NE Ohio means leaf color is starting. 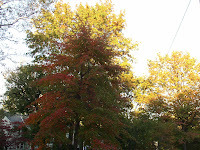 I love to walk the dog and shuffle through the leaves. The mornings are crisp and I get to start wearing my sweaters. 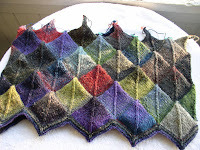 My Noro cardigan is growing square by square, but looks much as it did a week ago. I'm past the bottom of the armholes, but it's hard to see that. 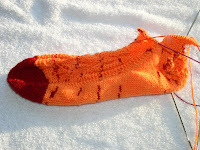 The Mystery sock hit a snag, when I didn't read the directions properly. It's back on track now, and farther than the 2nd picture shows. That picture better shows the color. The deadline for this one is Oct. 31, so I might make it. 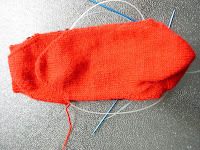 Luci's socks are making good progress, but I think I want to sell the pattern to a magazine, so it's turned into a stealth project.You see a finished sock and the toe of the 2nd sock. The black patterning doesn't show. 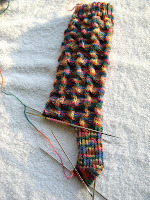 JB's birthday socks have most of a foot now, but here's the latest picture. Aall 3 pairs need to be finished by the end of the month! 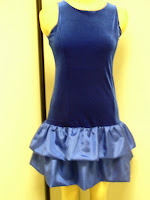 I've also been sewing new dresses for people. The only one I have to show is for my little violinist to wear for performances that don't require a long formal dress. It's stretch velvet and taffeta. I got ambitious and decorated the shop for Halloween. 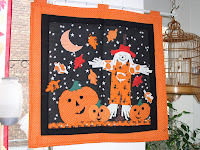 This banner was made a number of years ago, not my design, but I like it a lot. I may show more decorations later this month. .